The Busy Giffs: The NEW Redesigned LÍLLÉbaby CarryOn Toddler Carrier! The NEW Redesigned LÍLLÉbaby CarryOn Toddler Carrier! Hooray for a newly redesigned LÍLLÉbaby CarryOn carrier! I love LÍLLÉbaby, and honestly, it's not a secret. Between older posts, like when we went to Disney and got to try out the Essentials carrier, and instagram posts, like Daddy wearing at Ikea, littles wearing littles, a sleepy boy at Disney, and a regular Target trip, I promise you've seen my LÍLLÉbaby Carriers before! While both of my kids still fit in the LÍLLÉbaby COMPLETE carriers, we've really been grabbing our toddler-sized CarryOns more lately. 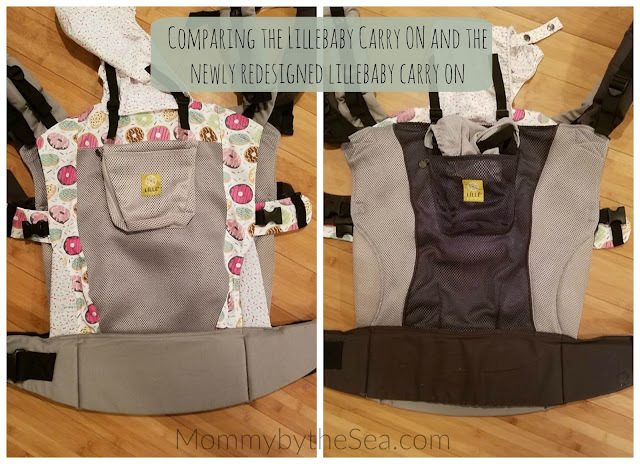 You can see a comparison of the COMPLETE and CarryOn here, but Lillebaby took all of the feedback they received from their customers and redesigned their CarryOn! It's easy to see in the above picture how different the fit is! The Donuts and Sprinkles carrier is the newly designed one and you can see that it is not quite as wide and a bit taller than the older model CarryOn. 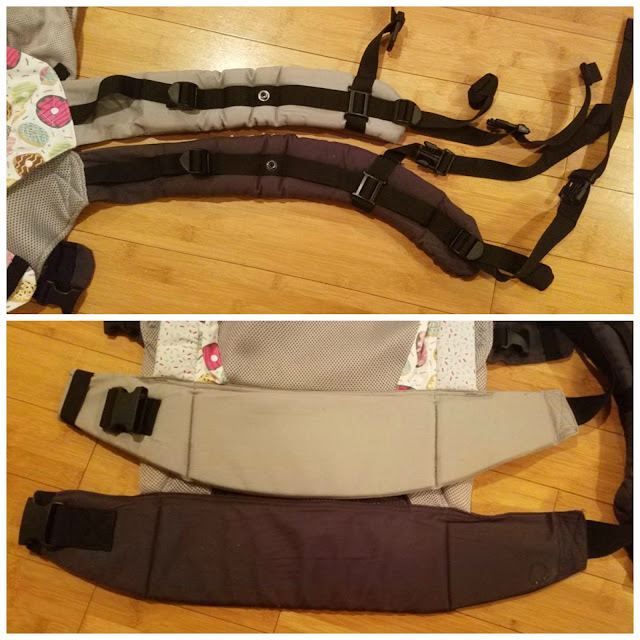 The CarryOn's deeper seat and tall torso (tallest one available) are specifically designed to secure and support children size 2t pants and taller. The new panel is 20.5" designed to support even larger children. Lillebaby shortened the straps for a closer fit, which you can see here. The newly redesigned CarryOn is the light gray! You'll also notice that the waist band is more curved. The wider waistband supports larger children and makes it easier on you. I carried my 5 year old, who is 40 lbs, in it on a walk this weekend with no back pain! 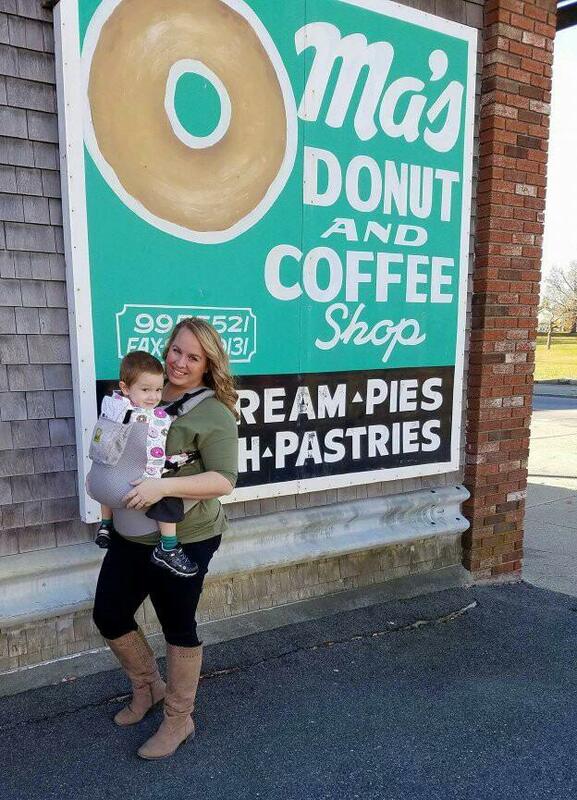 Lillebaby's breathable mesh is perfect for all weather, whether it's a hot day in Florida, or a with a few layers during a cold day in New England. The newly redesigned Carry On still offers all the things you love about the Original CarryOn as well! It's already love for us and our newly redesigned LÍLLÉbaby CarryOn. I mean, seriously, who doesn't love donuts!? Did I mention they are launching TODAY? You can head over to Lillebaby's website and grab one now, for only $150! Be sure to let me know if you grab a Donuts and Sprinkles one, or one of the other gorgeous patterns!